The Sound of Silence is a companion volume to Broken Silence. It contains interviews with a number of film players who had been reluctant subjects when I was gathering participants for Broken Silence. Persistance paid off! 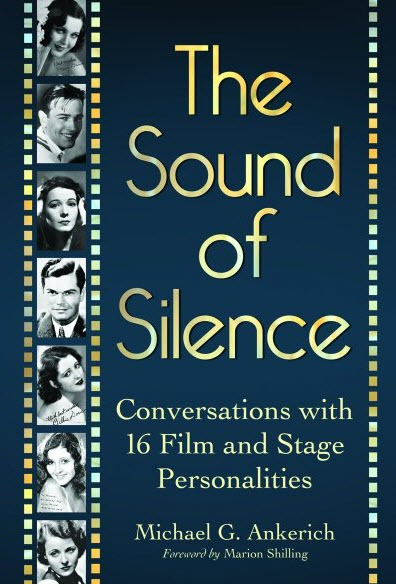 Included in The Sound of Silence are Hugh Allan, Barbara Barondess, Thomas Beck, Mary Brian, Pauline Curley, Billie Dove, Edith Fellows, Rose Hobart, William Janney, Marcia Mae Jones, Barbara Kent, Esther Muir, Anita Page, Marion Shilling, Lupita Tovar, and Barbara Weeks. If there is a common thread among those included in The Sound of Silence, it is that most began their careers in silent films and continued at least into the very early stages of talking films–some did most of their work in sound. For this volume of interviews, I approached a group of film players as diversified as the many roles they played in Tinseltown. Most of those who gave interviews for The Sound of Silence had never spoken this extensively about their work in motion pictures. Billie Dove and Mary Brian were the most reluctant subjects in the book. Complaining of a nagging cough, Dove wavered several times, before finally agreeing talk with me. For the initial interview, we spent over two hours on the phone. The next year, she invited me to spend the afternoon with her at her Rancho Mirage home. She was a stunning beauty, still! I have actress Jean Porter Dmytryk to thank for setting me up with and driving me to my appointment with Mary Brian, who insisted I put away the tape recorder if I wanted an interview. Otherwise, she would give me a performance. I put away the tape recorder! Brian, along with Anita Page, a charmer and personal favorite, started out as ingenues in silent films and soon graduated to leads. Page and I stayed up until 3 a.m. one evening sipping champagne and nibbling on cheese puffs as she told me about herHollywood. Marion Shilling, who graciously wrote the foreword, began her career as an ingenue at MGM in the late 1920s. She later became one of the screen’s most dependable Western heroines of the 1930s. I will never forget her Scotches and Ginger Ales and the weekend I spent at her home at Redondo Beach. Barbara Barondess, Rose Hobart, and Esther Muir were first on the New York stage before breaking into films at the coming of sound. Barondess, who shared painfuls details about aborting her child with Broadway producer Jed Harris, along with Hobart and Muir, developed reputations as dependable character actresses. Muir was a fine screen comedienne, memorable for her role in A Day at the Races with the Marx Brothers. Lupita Tovar, an exotic Mexican beauty and the mother of actress Susan Kohner, is a film legend in Mexico, remembered among film fans for her role in the Spanish version of Dracula and for several Westerns with Gene Autry and George O’Brien. Of the actors interviewed for The Sound of Silence, William Janney and Thomas Beck were on the stage before being wooed into films. Handsome Hugh Allan played leads during the last years of the silent era. He retired in 1930, uncertain about his future in films and disgusted over studio politics. Marcia Mae Jones and Edith Fellows had strong careers throughout the 1930s as child actresses. Like many of their contemporaries, they did not make successful, nor particularly happy, transitions into adult roles. Barbara Kent and Barbara Weeks gave me their in-depth interviews following their careers. Kent, at age 90, was on the golf course when I phoned to talk about her journey through Hollywood. Weeks, a versatile actress who could handle Westerns, musicals, and drama with equal ease, was eager to share insighful anecdotes about Samuel Goldwyn, Florenz Ziegfeld, Bette Davis, and Marion Davies. I have to know – did you and Rose Hobart discuss Joseph Cornell’s surreal avant garde tribute film, Rose Hobart? Had she seen it and what did she think if so? Boy, Michael’s description of this book has certainly whetted my appetite for the this book!